Entries must be registered prior to 11:00 a.m.
Judging begins at 11:00 a.m. Awards will be presented at 1:00 p.m.
Hand Processed Without The Use of Kits. 1. All baskets of any kind or description are eligible. 2. The entrant (or some member of the immediate family) must have made the baskets within the past three years. 3. Baskets must be made of split white oak and cannot be made from kits. 4. 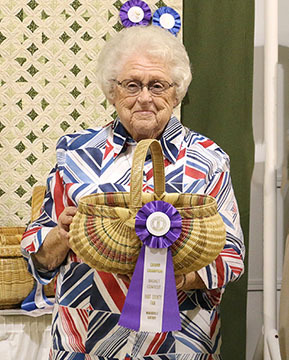 The Family Medical Center has the right to purchase the winning baskets or the entrant can agree to make a basket similar to the winning basket for the Family Medical Center for display in its collection. The price of the basket would be in addition to the prize money. Please help us keep this tradition so we can display these winning baskets locally. 5. This contest is open to all residents of Hart and adjoining counties. Each person entering a basket will receive a $10.00 Appreciation Prize for entering; excluding antique baskets.